It has been a while since I made a post. Its enough to keep up with Facebook, Instagram, and Pinterest. But I wanted up give an update on how my Primal way-of-eating has evolved. My diet has changed into a Plant-based Primal Diet. The base of the diet is green leafy vegetables, followed by all the other vegetables, and fruits. Then we add in the starches root vegetables, grains, and legumes. Nuts and seeds are stacked on top of that. Grass-fed ruminants and seafood are next. Eggs, pastured pork and chicken. Raw dairy products like milk and cheeses. And at the very top of a pyramid would be modern products also known as junk food, crap, and man-made products, eat very little of these foods. If you want to lose weight stick to the vegetables, fruits, and starchy foods. Do not add fat, this includes avocados. Eat only when you are hungry and not on a schedule. Stay on this diet until you lose all the weight you want. 28 or 30 days isn't enough, do it until your done. Don't drink alcohol. But several doctors and writers have written about this way of eating and have some short and very concise articles on the subject. Below are links to these articles. They are well written and say everything I would say about a healthy diet. Have a great summer, well what is left of it. I enjoyed PaleoFX 2015 this year it was really good. But unfortunately I don't think it was as good as it has been the last two years. The event was larger this year and took up the whole Palmer Event Center. The extra space was great and made it where the rooms weren't too crowded. I received my CEU's and certificate today for my Superhuman Coach Course. The Superhuman Coach Course is an advanced education program for personal trainers, coaches, and other professional in the fitness, health, and medical field. Here is a description of the course from the FAQ page on the Superhuman Coach website. 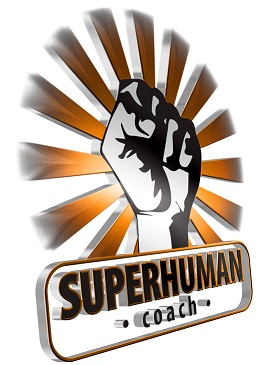 "Superhuman Coach Network provides you with a complete online 12 month education in advanced topics of performance, recovery, digestion, brain, sleep, hormones and fitness business – and also connects you to a global mastermind of expert coaches, along with direct personal mentorship from Ben Greenfield for your personal and career growth. Through monthly workshops, exams, and a robust online forum, you’ll learn in a supportive environment from Ben Greenfield and an expert team of health and nutrition experts and physicians, while also being given the opportunity to publish your videos, audios and articles on our site and be connected to clients who come the Superhuman Coach Network to achieve their goals". You can go to the information page for a more detailed synopses of the program. This page describes each module of the program and all the material that is in program. "Author of the New York Times Bestseller “Beyond Training“, Ben Greenfield’s balanced approach to fitness, nutrition and health comes from his extensive experience in the fitness and wellness industry as one of the country’s leading personal trainers and wellness consultants. In 2008, Ben was nominated by the NSCA as America’s top personal trainer, and in 2013 and 2014, Ben was voted as one of the top 100 most influential individuals in health and fitness." I highly recommend his podcast. Learn everything you need to know about health, fitness, human performance, and much more from Ben Greenfield and Brock Armstrong. The cover breaking news in all things health and fitness related as well as answer questions from listeners. Ben also has special podcast where he interviews the greatest minds in their fields. But enough about Ben. :-) Let's talk about me because I'm one of Ben's Superhuman Coaches. 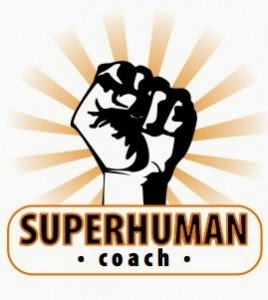 You can find a list of all the Superhuman Coach on the Superhuman Coach website or over at Greenfield Fitness Systems. All the coaches have completed the Superhuman Coach Program and are being mentored my Ben. Coaches that complete the coarse can get CEU's from the personal training association that they have accreditation through. I am a National Academy of Sport Medicine (NASM) Certified Personal Trainer (CPT) as well as a NASM Fitness Nutritional Specialist (FNS). 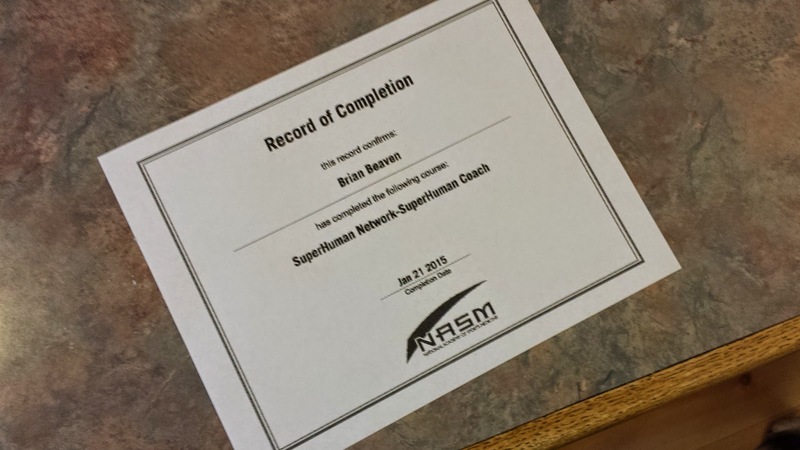 I recently submitted my Superhuman Coach Certificate to NASM and I received CEU's for completing the course. Happy New Year! I'm a little late on posting this, sorry, just been busy. I've made over 50 videos of sledgehammer exercises and I've uploaded most of them to my Youtube channel. The sledgehammer is really a fun tool to exercise with. It is a great workout and the time passes quickly while you are having fun swinging the sledgehammer. Here's the overhead wood chopping exercise. Be sure to check out all of the sledgehammer exercises.